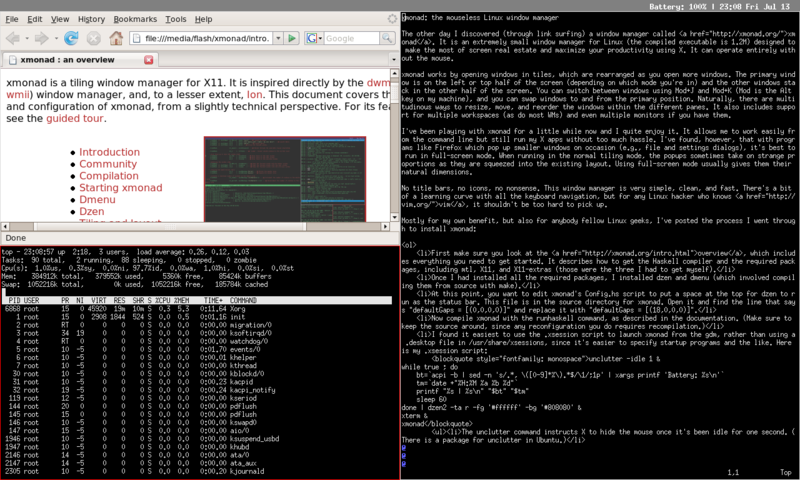 The other day I discovered (through link surfing) a window manager called xmonad. It is an extremely small (the compiled executable is 1.2M), lightning fast, sleek window manager for Linux designed to make the most of screen real estate and maximize your productivity using X. It can operate entirely without the mouse. xmonad works by opening windows in tiles, which are rearranged as you open more windows. The primary window is on the left or top half of the screen (depending on which mode you’re in) and the other windows stack in the other half of the screen. You can switch between windows using Mod+J and Mod+K (“Mod” is the Alt key on my machine), and you can swap windows to and from the primary position. Naturally, there are multitudinous ways to resize, move, and reorder the windows within the different panes. It also includes support for multiple workspaces (as do most WMs) and even multiple monitors if you have them. I’ve been playing with xmonad for a little while now and I quite enjoy it. It allows me to work easily from the command line but still run my X apps without too much hassle. I’ve found, however, that with programs like Firefox which pop up smaller windows on occasion (e.g., file and settings dialogs), it’s best to run in full-screen mode. When running in the normal tiling mode, the popups sometimes take on strange proportions as they are squeezed into the existing layout. Using full-screen mode usually gives them their natural dimensions. No title bars, no icons, no nonsense. This window manager is very simple, clean, and fast. There’s a bit of a learning curve with all the keyboard navigation, but for any Linux hacker who knows vim, it shouldn’t be too hard to pick up. First make sure you look at the overview, which includes everything you need to get started. It describes how to get the Haskell compiler and the required packages, including mtl, X11, and X11-extras (those were the three I had to get myself). Once I had installed all the required packages, I installed dzen and dmenu (which involved compiling them from source with make). At this point, you want to edit xmonad’s Config.hs script to put a space at the top for dzen to run as the status bar. This file is in the source directory for xmonad. Open it and find the line that says “defaultGaps = [(0,0,0,0)]” and replace it with “defaultGaps = [(18,0,0,0)]”. The next six lines describe the text I want dzen to display in the status bar. The “date” part displays the date in the form “21:59 Fri Jul 13”. The other part extracts the battery percentage from acpi and formats it (which is important because I’m on a laptop). The printf command concatenates those two pieces of information. The sleep command tells dzen to wait 60 seconds between each update. The last line actually passes that loop to dzen and sets some options. Finally, the xmonad command starts the window manager itself. So there we go. Yet another nifty window manager for Linux. UPDATE: Tassilo posted some more technical information about xmonad on his blog. Take a look if you’re interested in diving in yourself. Also, thanks the the guys at xmonad for their link. One window manager to rule them all...?